M. B. Foster, Editor, 718 Magnolia Ave., Orlando, Florida. Annual Dues: $3.50 a year (foreign $4.00) which includes subscription to the Bulletin. Write for details to Miss Victoria Padilla, Secretary, 647 Saltair Ave., Los Angeles 49, California. The caption for our cover, this issue, could easily be "a walk through a shaded garden lined with bromeliads will never be a lonely walk." Your garden may not be shaded by moss-festooned live-oaks, it may not be in Florida, Louisiana or California but you could still place a few bromeliads along a garden walk even in the North . . . . that is for the summer months at least. The potted plants could be plunged in the soil where they would receive a nice filtered light and they would enjoy the rains and the freedom of the garden and your walk would be a friendly one. All photos in this "Bromeliads in the Garden" issue, except the one on p. 63, are by M. B. Foster. The announcement of the death of Ernest Chabot came as a great shock to all of us who knew him. He was the advertising manager for Lord and Burnham Greenhouse Co. He gave the Bromeliad Bulletin our first advertisement. Mr. Chabot was not only an excellent advertising specialist, he was also a true lover of plants and a booster of bromeliads. He was editor of the column "The Home Greenhouse" in Flower Grower where he often praised bromeliads and author of "Greenhouse Garden For Everyone" and "Rare Greenhouse Plants" in which he gives over three pages to bromeliads. (See Vol. 1, No. 3, Brom. Bull. p. 26) His sincere interest has done much for the decorative plant world. By the long, tireless effort of Victoria Padilla, with assistance from Ben Rees, a complete Index to the first four volumes of our Bromeliad Society Bulletin has been prepared for publication; it was intended for a bonus to members early in 1955, but because weight of the decision by Florida Board members was on the side of waiting for a Five Year Index instead, it has been postponed . . . . to appear at the end of our fifth year. Instead, for this year, of 1955 we have a surprise bonus . . . . from Jamaica – a broadcast, written for and read to High School students, by George R. Proctor, Botanist of the Institute of Jamaica, Kingston, B.W.I. on May 3rd, 1955. It is an excellent review of basic concepts concerning bromeliads, and can serve as an introduction to the family characteristics for new members. An order for our Bromeliad Handbook from Leningrad, U.S.S.R. was the latest surprise received in the editorial office and it arrived before the big Summit Conference at Geneva! Dr. Russell J. Seibert, our second Vice President, who has been Director of the California Arboretum at Arcadia, California, has recently left that institution to become the Director of the Horticultural Division of the Longwood Foundation at Kennett Square, Pennsylvania. The Longwood Gardens, established by the late Pierre DuPont, have long been famous for their magnificent horticultural displays. Our best wishes go with Dr. Seibert for its continued success. Although California is the only state bordering the south where bromeliads are not found growing natively, there are probably, with the exception of Florida, more bromeliads to be found under cultivation in the area south of Santa Barbara than in any other section of the United States. This is rather odd when one considers the adverse conditions under which these plants must grow. The climate of Southern California is similar to that found in the Mediterranean region–long, dry summers and cool, moist winters, just the type of weather which most bromeliads do not like. But such a situation merely presents a challenge to the intrepid California gardener–and come drought or flood, freezing or scorching weather, he is always willing to try his hand in taming the wild or adapting the exotic to his desert-like conditions. Bromeliads are to be found more and more as a part of the landscape design in Southern California, and strangely enough, they are responding to the many peculiar situations under which they are finding themselves. Billbergias are the most commonly grown bromeliads in Southern California and are seen everywhere. They are used successfully bordering the shady walk, filling in a dark spot where nothing else will grow, acting as a relief alongside begonias and fuchsias in the sheltered garden, hanging gracefully from hanging baskets, or drooping reflectively over the edge of a pool. The large Aechmeas, Ae. caudata variegata, Ae. distichantha, and Ae. bracteata are being grown as accent notes where a tropical effect is desired. Large clumps of Ae. distichantha are effective when used to break up expanses of lawn, the leaves giving that often desired perpendicular effect. Instead of New Zealand Flax (Phormium tenax) Ae. caudata variegata is found to be equally imposing (and more so when in flower) placed on either side of a doorway. Ae. 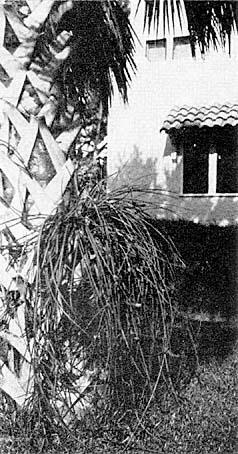 bracteata is often seen growing with aralias, palms, philodendrons, and bamboo in plantings against a modern house. In the coastal sections where frosts occur but seldom, many of the less hardy aechmeas, such as Ae. Weilbachii, Ae. fasciata, Ae. pineliana, and Ae. miniata are being planted in the open in rockeries. The author has a rock garden devoted exclusively to bromeliads–Aechmeas, Billbergias, Quesnelias, Nidulariums, and Neoregelias–the odd red, purple, and orange tones of the volcanic rock proving to be a striking foil for the colorful plants. Planted in partial shade, in half leaf mold and half sand, being given excellent drainage, the bromeliads are perfectly happy. The only problem will be to keep them within bounds. In plantings under large trees, landscape architects are tending to use more bromeliads grown in among ferns, Cymbidiums, Camellias, and other semi-shade lovers. Arid on the trees themselves, along side of Laelias, Epidendrums, and other hardy orchids, Aechmeas, Tillandsias, and Billbergias are being successfully grown. In the Oakhurst Gardens in Arcadia, where it often hits freezing during the winter months, bromeliads of many varieties are to be seen growing on the limbs of old, gigantic oaks–continuously blooming and increasing in size. As many Southern Californians are patio dwellers, much attention is being paid to making this living area as attractive as possible. Usually the effect desired is a tropical one, and bromeliads are used to help attain this feeling of lush, jungle growth. In one planting in the patio of a large department store, plants of Billbergia porteana, always large and striking, add a definite note of interest in among the palms and philodendrons. In patios, bromeliads grow successfully in open planters, in pots, in hanging baskets, in fernwood containers, or attached to bits of driftwood, a form of decoration currently very popular in this part of the world. Some of the healthiest bromeliads this author has seen are growing in the patio of a friend who resides in one of the driest and warmest parts of the Southland, two thousand feet above the San Fernando valley. Although Southern Californians are doing their best to make their section of the state a sub-tropical paradise, Southern California remains nevertheless a semi-desert region. (The rainfall for 1952-53 being eight inches). Thus more and more gardeners, unable to cope with the excessive alkalinity of the Colorado river water which they must use, are growing those plants which require little moisture–succulents and cacti. One of the most famous gardens of this kind to be found anywhere is located in the Huntington Botanical Gardens in San Marino. Outstanding in this garden is the collection of bromeliads–Puyas, Hechtias, Dyckias, and the like–which when in bloom attract visitors from near and far. This planting has done much to encourage the growing of terrestrial bromeliads in home gardens. There are many excellent specimens of Puya alpestris to be seen in private estates, and this bromeliad has become so popular that it can be purchased in any of the larger nurseries. So in the open or under shelter, in the sun or in the shade, under trees or clinging to their branches, bromeliads are now to be found in California gardens–a permanent part of their landscape design. Bromeliads are wonderful plants. But like so many good things in life, they need contrast to bring out their best. A garden of just bromeliads would be too rich in one type of foliage. By adding companion plants, as we do in California gardens, there can be a nice balance between large and small, thick and thin, or light and dark. The "dark" could come from a rich massing of black green Clivia foliage. About seven years ago this writer was fortunate in obtaining a flat of hybrid Clivia seedlings. The only available ground in full shade was behind a large massing of various bromels where the earth sloped gently upwards. All one hundred of the little Clivias were planted there and the years went quickly by. Today these magnificent Clivias form a lush thirty-inch tall background for striking clumps of Aechmea Weilbachii, Nidularium innocenti, and various Billbergias. The exceptionally wide leathery leaves of the Clivias provide just the calm influence needed by the "busy" bromeliad clumps. Of course, when the background blooms then the foreground is not noticed. To go from the large to the small, there is a most interesting little plant that blends beautifully with bromeliads. As you all know, to be fully appreciated bromel clumps must not be grown packed solidly together. Therefore, considerable ground is going to be visible if the plants do not touch one another. The perfect plant trailing over this bare soil is Ceropegia. There are several species available, all of which have thread-like stems and small round or narrow succulent leaves. Their growth is delicate and flat to the ground so never is competition given to the bromel specimens. The only color offered is from a slight silver sheen on the leaves of some species, the flowers being inconspicuous. Though not a spectacular plant, it is always noticed when seen wandering along the ground under an Aechmea. There is another trailer which has an affinity for bromeliads and that is the Philodendron. But here we have a laugh because the little Ceropegia leaves are less than an inch across whereas the Philodendron leaves can be almost frightening in size. These gigantic leafed vines form a great clan and hold an irresistible attraction for those of us raised in three feet of snow. A mass of colorful Aechmeas or Neoregelias planted at the base of a Philodendron or a Monstera deliciosa can be very striking. The large dramatic leaves bring out the color and unusual form in the bromeliads. In your garden quantities of low Cryptanthus grown thickly under the gigantic leaves of a Philodendron selloum will do much towards adding new members to the Bromeliad Society! Probably part shade bromels would be grown more often if small areas of ground could be freed from all day sun or prevailing wind. Frequently all that is needed is a protective screen of foliage to catch the sun and slow down the wind. The bamboos are a possibility. Graceful in habit, thick in growth, they blend well with the bromels. The non-travelling types as the Fern Leaf Bamboo (Bambusa multiplex) are no problem, but with the travellers like the Golden Bamboo (Phyllostachys aurea) a gardener must all but construct a Maginot Line! Their traveling sprouts should be held in check by a cylinder of concrete from soil line down to at least two feet in the ground. If not done, the bromeliad collection at the base of the bamboo will soon be "swallowed up" by the sprouts, and in fact, even the gardener will be so consumed if he should stand too long in one spot! While the majority of the most beautiful and ornamental species of bromeliads coming from the tropical forests of South America are strictly epiphytic and can be brought to show their full beauty only under glass with temperature and humidity under control, there are many worthwhile attractive species quite amenable for growing in the open ground (some preferably so) with a minimum of shelter in places where temperatures do not fall too low and some protection from the hot burning sun and dehydrating desert winds can be provided. Plant lovers without glasshouse facilities need not forgo the pleasure of their successful cultivation and can enjoy their fascinating beauty without too great difficulties. The easiest and most adaptable bromels are of the xerophytic type, the group whose members resemble small agaves and aloes in appearance, and like them can take tough conditions, necessary neglect and adverse weather without much harm. Most Dyckias will thrive well even in poor dry ground or rocky soil. Like our native Agaves, Dudleyas, and Echeverias, they will withstand hot sun, long dry spells, moderate frosts if the ground is not too loose and sandy or too shallow. Dyckia brevifolia (sulphurea) makes large tight mounds. Dyckia altissima, both varieties, does equally well. Dyckia rariflora and its varieties, remotiflora, etc., will not develop as long leaves as under glass but will grow more compact and flower and multiply even better in the open soil. They form large clumps, their stolons coming up near the mother plant. Dyckias form seed readily and plentifully and self-sow, but the tiny seedlings succumb to the first dry spell. I believe they would readily naturalize if browsing animals could be guarded against. Ananas comosus (sativus) will grow from a rooted top and bear a pineapple in three years–it should have some shade. Ananas ananasoides grows even easier and forms more offsets. The small, often vividly banded and colored ornamental dwarf pineapples are too rare and precious to be risked in an outdoor planting. Hechtias, with their loose rosettes of gracefully recurved leaves, grow slowly enough to be manageable and do well. Hechtia texensis is probably the only one available and seems to be somewhat more tender than Dyckias, suffering below twenty degrees. Puya spathacea is rather large, about three feet wide and as high at flowering size. It has a red stemmed branched inflorescence; the flowers being small, dark blue-green. It is very showy, easy to grow, and will flower five to six years from seed. Puya alpestris in flower is an incomparable sight. Most will agree that this is surely one of the most beautiful flowering plants of the world. A magnificent yucca-like spike, with fifty, one hundred, and more individual flowers, the gleaming orange stamens emerging from the depth of nectar filled chalices of somber blue-green of a metallic sheen awakes in one a feeling of mystic wonder. To my knowledge these two Puyas are the only ones available at present from nurseries. Bromelia serra and Bromelia balansae are, like Puyas, armed with little hooked spines, but to see their "Hearts of fire" in their glorious beauty should warrant them a place in spite of the spines. They are very easily satisfied with almost any place allotted to them, growing without care. Other xerophytic and semi-xerophytic species available and suitable are Ochagavia, Aechmea recurvata (ortgiesii) Fascicularias, etc. Many Billbergias and their hybrids, and the larger leaved Aechmeas and their hybrids, will readily take to open ground. So will some Neoregelias, Quesnelias, etc. Many do even better in open soil and when left undisturbed, form large clumps. Five to ten year old specimens may have from twenty to fifty flower spikes at one time and show in this way a beauty that no small glasshouse plant can equal. Some of the vigorous Billbergia and Aechmea hybrids mature their offshoots quickly and flower in succession so that an old plant often is in bloom throughout most of the year. The above plants take most readily to the root-debris around palms. There they can anchor their roots, find enough nourishment and sustaining moisture to grow to an astonishing size. They may burn a little in summer and will not have the dark succulence of glass protected plants, but they flower and multiply. In planting avoid the "drip-zone" that is the outer edge of the umbrella of the Phoenix. Give Nidulariums and the soft leaved Aechmeas the most shaded side. Outdoor growing does bring a few problems the glasshouse growers are spared. The foremost is pest-control. If the ground is infested with ground mealy-bugs or root-aphids, they must be cleaned up first. Scale will build up in summer and should be held down with a nicotine sulfate or a little oil. One of the most troublesome pests is snails and also slugs that find the dark moist leaf-cups an ideal hiding place. They should be washed out with a hose. If your water is at all alkaline or hard, do not attempt to keep the leaf cups filled with water. If cold should damage plants, cut off this frozen part as soon as possible before rot sets in and wanders into the basal part. The woody caudex has generally enough dormant buds to give the plant a fresh start. Fortunately, most of the above mentioned bromels are almost unbelievably adaptable, clinging to life with a tenacity so that nothing but total dehydration or freezing seems to be too much for them. They may not be at their splendid best if they have to rough it in open ground, but they will do well enough to delight you with their unusual beauty and strange form and make a bromeliad enthusiast of you, leading to increasing enjoyment as you become more familiar with this group of plants. And please note–any cultural hints apply only to conditions prevalent in the vicinity of Los Angeles and should be modified according to conditions existing in other areas. Among the rocks Dyckia frigida blooms three to four times a year in Florida. Flowers are deep orange on tall branched spikes. 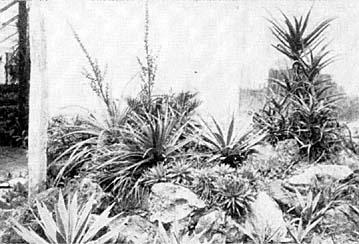 Dyckia brevifolia, in foreground, clings to the terraced rocks. Extensive use of sturdy, spiny bromeliads in garden masses prove to be decorative, contrasty and colorful in our Florida garden. These persistent, vigorous bromeliads hold their own proudly beside any of the other succulents such as Aloes, Cacti, Agaves, Euphorbias, and can stand all the elements of a subtropical variable climate. What meets the eye when they are NOT in bloom (having in mind particularly, Dyckias, Hechtias, Ananas, Bromelias, Deuterocohnias and Puyas) is a mass of spiny rosettes in numerous shades of greens, greys or bronzes whirling around the garden in a dizzy but pointed accent. They crawl among the rocks or settle down on the sand equally satisfied and make us think they have always been there. Among the above six genera we have added various Neoregelias and an Aechmea or two that are particularly sturdy individuals who enjoy tough, spiny companions. The colorful Neoregelia spectabilis leaves tipped with pink "fingernails" and the N. marmorata hybrid sprinkled with red spots, contribute a splash of color that no subtropical garden should miss. What meets the eye when the Dyckias, Hechtias, Ananas and Aechmeas ARE in bloom altogether, as happens every spring in our Florida garden, is both arresting and exciting to say the least. Great spikes of yellow and orange from the Dyckias, and from the Aechmea Lindenii (which has an orange cylindrical head topped with large, yellow, protruding flowers) mingle spontaneously with startling dashes of cerise from the spiny spikes of Aechmea distichantha and Hohenbergia stellata adorned with "stars" of cerise bracts around violet-blue flowers high on its proud stalk. The rounded rosettes of bromeliads blend with the naturalistic contours of our curving rock-lined walks. They are included in what seems to be a natural "totality" when we make a Spanish Bayonet (Yucca aloifolia) fence or a sprawling feature of Euphorbia splendens at the feet of a thousand fingered hedge of Euphorbia tirricauli. Spiny spikes of Aechmea distichantha (in foreground) vie with colorful yellow heads from Aechmea Lindenii (in background) in the spiny garden assembly. They take our winter drought–and our excessive summer rains with equal aplomb because our sandy soil allows ample drainage. Oak mulch is a double benefit, keeping the weeds down and giving a brown carpeted contrast setting to the color of the plants. In Brasil, where we find most of our spiny type of bromeliads, with the exception of the Puyas, we find growing together in the caatinga (comparable to a Mexican mesquite) and on other dry plain areas or rocky ledges, many other succulent forms such as Euphorbias, cacti and bromeliads with here and there xerophytic orchids and aroids that make up the unique settings for these spots that can take it or leave it when it comes to rain or drought. None of them are pampered nor should you pamper them if you wish them to produce their crispness in developing their individual self-protective characteristics. We have seen and admired the lush rock gardens of the North in springtime, but there will never be anything quite comparable to the xerophytic garden of the subtropics. The very independence of the plants in these spiny gardens cannot help but have our respect because they live and thrive in spite of one. 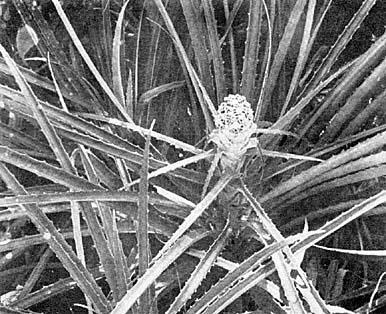 A spiny palm, such as Phoenix reclinata, is not amiss in a spiny garden. It furnishes some shade for those bromeliads that like a little of it, species such as Aechmea Lindenii, A. distichantha, A. phanerophlebia etc. Prior to the spring flush of garden excitement our garden is well decorated by Aechmea phanerophlebia which blooms in December or January (but which retains its inflorescence into April), or Portea petropolitana var. extensa with its compact head of delicate orange, green and violet flowers. (See cover Brom. Bull. Vol. I, No. 2). Just after the spring flush our garden is singularly blessed with the long-lasting spikes of Aechmea bracteata which hold their sparkling color from Spring until late Fall; the brilliant red, six inch bracts are so gay, waving cheerfully in a breeze, that we have been accused of tying ribbons on these stalks. The price for all this beauty and interest is really quite reasonable. Aside from an occasional weeding and watering their food requirements also seem to be at a minimum, so little fertilizer is needed. Just give them a place to live and they will do the rest. 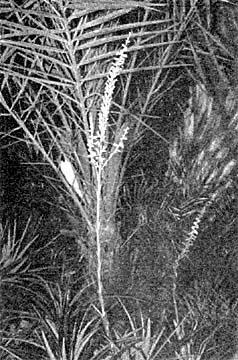 A spiny palm, such as Phoenix reclinata is not amiss in a spiny garden. It serves as a fine back-drop for Dyckia X Lad Cutak or any of the terrestrial bromeliads. Dyckia microcalyx is an attractive terrestrial from Matto Grosso, Brasil. Its lemon-yellow petals with grey-chartreuse sepals are quite in contrast to it's stiff, defensive leaves. The rounded rosettes of bromeliads blend with the naturalistic contours of our curving, rock-lined walks. Weeding a plant bed can be a disagreeable chore, or it can be a pleasant task depending upon the way the weeder looks at the job. I have pulled weeds for nearly fifty years, with interruptions of course, in Vermont, Massachusetts, and New Jersey. I have pulled them from the lowly onion rows along up the scale to the majestic dahlia, but the sharpest afternoon I ever spent was here at my first weeding task in Florida. On one of his busy afternoons, Professor Foster had taken time to show me through his tropical greenhouses. I had enjoyed it so thoroughly it seemed only fair for me to do a bit of weeding in his outside bromeliad garden. I could become better acquainted with the bromeliads at the same time. 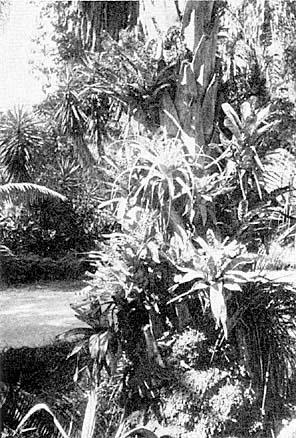 Armed with leather gloves, whose wrists proved far too short, and a long-handled stiff wire hook, I met the bromeliads and their spiny associates, socially. As the only wanted plants were those with spines on the sides and tips of their leaves, it was easy to see the intruders, although not so easy to remove them. The softest weed of all grew thickest underneath the armored leaves of the Dyckias. My hook slid in easily after them while they just as easily broke off leaving the shell-like white bulb from which they sprang (over night I was told) nicely buried out of reach of my searching fingers. Even the Florida grasses, deep-rooted as usual, found delight as from the sanctuary of the needles they raised their slender heads. Even the stately palms growing in the garden were armed against me. This I learned in sharp surprise as I arose from my crouching position to relieve a cramp when a spine punctured my shoulder almost sending me on my face into the largest spiny bromeliad in the garden. Weeding close to the Neoregelias would be a cinch after the rugged Dyckias, or so I foolishly thought, until I found the tiny, saw-teeth on each one of their papery leaves which became, plainly, a sign, saying, "Hands Off!" As to when most of the multiple punctures in my arms were made I have no idea, so they smarted less vindictively. Before I finished the bed a very obliging shower chased me inside the tropical heaven under glass where I spent a wonderful hour, again, among the myriad bromeliad colors and sizes far beyond defining. Of course, there were other beautiful plants too, but being a bromel-convert, I barely saw those. The most common species of the genus Bromelia in our subtropical gardens is B. Balansae. This species was first distributed under the name of B. serra. B. Balansae is native to Argentina, Brasil and Paraguay. It has an upright inflorescence that sometimes reaches four feet. The flowers are borne in a rather tight fitting panicle which branches out as the fruit ripens. B. serra bears a much smaller and more compact semi-globular flower head and the inflorescence seldom attains more than twelve to eighteen inches in height. Both species are very showy when they are coming into flower, although B. Balansae puts on a much more spectacular show with its crimson red bracts which surround the inflorescence. On the Cover page of The Bromeliad Society Bulletin, Vol. 2, No. 3, May-June 1952, is shown a very good photo of B. pinguin. This species is common throughout the Caribbean and West Indian area, and while there have been some plants of this species in a few gardens, it has not been as popular as B. Balansae or the B. serra var. variegata because of its less spectacular color display. Unfortunately, during the past fifteen years or more, practically all of the species in the genus Bromelia to be found in our southern gardens, or in the northern botanical gardens, has been labeled B. pinguin. 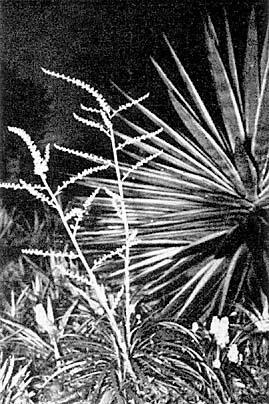 The genus in general has been a bit confusing to both botanist and layman but the fresh material of both B. serra and B. Balansae the writer collected in 1939 and 1940 helped to clear up some of this confusion. I have collected more than a dozen species of these well-armed spiny members of the genus Bromelia, two of them being new, and I can quite readily understand why so many poor and often incomplete herbarium specimens have been presented to the botanist for identification. Bromelia serra var. variegata M. B. Foster var nov. This new variety of Bromelia serra was first seen in the Dommerich Estate at Winter Park, Florida. The plant was not labeled and no one knew its name or origin. The writer procured these plants and has grown them since 1927. It has the most striking foliage of any of the species of the genus Bromelia and can withstand extreme neglect in the xerophytic garden. When the flowers are pollinated it will later produce its orange colored fruits but several unsuccessful attempts I have made to propagate it from seeds have been in vain. All of the seeds upon germination have appeared as pure albinos and have soon sloughed off from the lack of chlorophyll. Thus all propagation has been made only by stoloniferous offshoots. Two plants of Aechmea Orlandiana were placed in the boots of this Phoenix sylvestris palm seven years ago. Now they appear to be fifty separate plants, although actually only two continuous growths with many plant heads. Those of us who are lucky enough to live in the subtropical climes can have the pleasure of a tree garden as an attractive, carefree feature to the garden area. A tree garden in the tropical jungle includes orchids, rhipsalis, bromeliads and a host of other epiphytes; in making our own, here in Florida, we neglected all the plant families except the bromeliads! So, we have our palms full of Aechmeas, Billbergias and Tillandsias. It is the "boots" of the Phoenix or Sabal palms that make such favorable starting places for bromeliads. This pocket holds the bromeliad upright while it is getting established in the mass of natural residue of decayed matter also held by the "boot." Other than an occasional watering we forget them (except when visitors rave over them) and they take clouds or sun, drought or rain, hurricanes and cold weather, just as it comes without a protest. Once established the Aechmeas put out hard stolons that cling to the palm and form an encircling procession, in time, around the trunk continuing their upward climb, apparently happy for they have increased abundantly and bloom vigorously every year. The rough bark of oak trees also serves very well for establishing a tree garden; the plants can be attached with string or covered wire at first but as soon as the new offshoots have put out roots you can forget them, for, from here they will be on their own without artificial support. Particles of leaves and debris, with now and then a bit of fertilizer from the birds, will drop into the cups of the leaves thus completing the rations for good bromeliad health. Acanthostachys strobilacea A cascading bromeliad thriving in the boots of a Sabal palmetto, Palm Beach, Florida. Perhaps we can more easily visualize cascades of ferns or Rhipsalis on a tree or palm than we can cascading bromeliads. What is a cascading bromeliad? The Acanthostachys strobilacea, (means spiny spike with cone-like fruit) only member of this genus, is a delightful bromeliad with cascading attributes that can add unusual charm, grace or interest to a tree garden or an inside hanging-basket. A genus first named by Klotzsch in 1841 (see Mez. 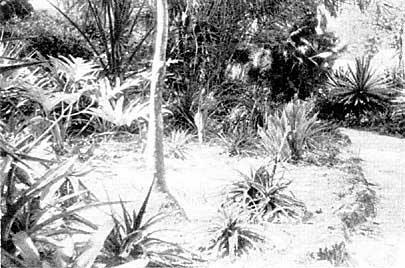 p. 101) went into several taxonomic changes such as Hohenbergia strobilacea and Ananas strobilacea. Many of the early botanists, whose names are associated with bromels, such as Glaziou, Riedel, Sellow, Regneli, St. Hilaire, Burchell, all collected it in several states in Central Brasil. My husband and I collected it in the states of Espirito Santo, Minas Geraes, Sao Paulo and Parana on our first trip to Brasil in 1939; it was a joyous find and we have had it in cultivation ever since. 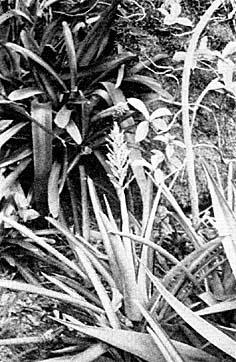 In 1937 Carl Mez (in Das Phlanzenreich) stated that it was not in cultivation, however, it has been reported in many botanical gardens among their rare bromeliads. 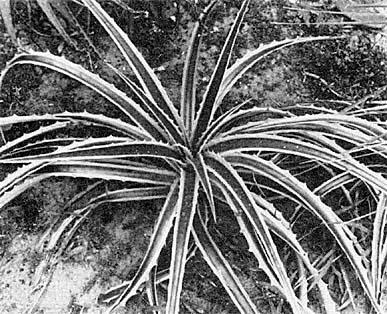 A genus having only this one species, it is an odd bromeliad with long, thin, terete, spiny leaves from a stoloniferous caudex. The inflorescence coming out of the terete leaves is like a tiny pineapple, being hard and composed of stiff red bracts. Whereas a pineapple has purple flowers, this has tiny yellow flowers. The stringy cylindrical leaves are olive-green with dim whitish spots which add to its attraction, but the whole mass of sprouting, stiff leaves bursting out of a tree or palm trunk, enlivened by the red heads of the pseudo-cone, make the plant excitingly attractive and irresistible. As a decoration for a tree garden in frost free areas it has the contour, the colorfulness, the massed effectiveness, as well as the sparse openness of a cascading fern. Give it plenty of acid leaf mold or fern fiber and ample water . . . . then you can have a joyous touch of charm. 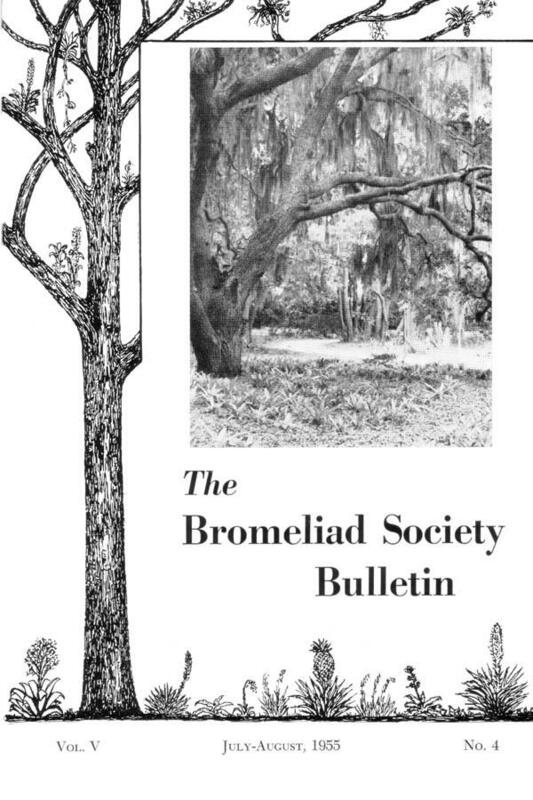 718 Magnolia Ave., Orlando, Fla.
© 1951-2012 Bromeliad Society International, All Rights Reserved.